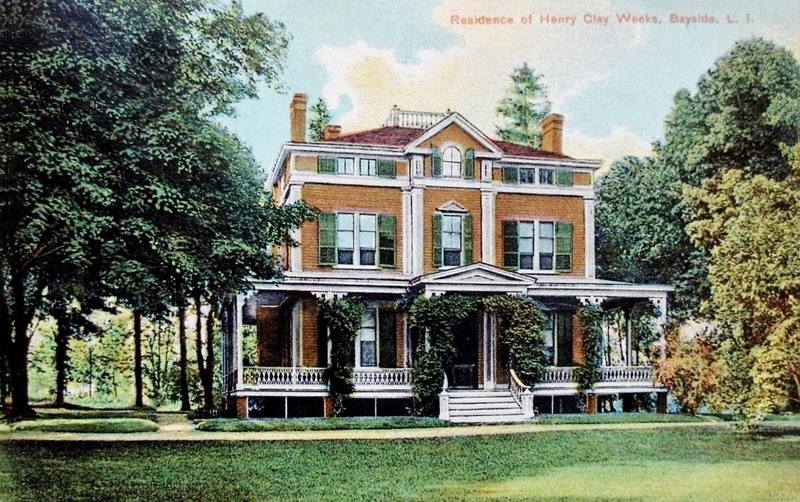 'Vista Lawn', the Henry Clay Weeks residence in Bayside. Weeks was the arch nemesis of mosquitos everywhere, serving as Secretary of the American Society for the Extermination of Mosquitos and leading the early fight to rid the pests in Queens. He also fought the New York and New Jersey Telephone Company in court over above ground telephone wires. His 1910 NYTimes obituary headline read "Friend of Shade Tree and Enemy of Mosquito and Telephone Company" but Weeks also involved himself with the American Institute, the American School and Historical Preservation Society and the National Geographical Society. He was also one of the first to organize a campaign against "speed maniacs" after the introduction of the automobile in Queens. Nice house -- very proper. His obituary said Henry Clay Weeks was an architect; I assume this house was his work. The comment about his son being investigated for graft was also interesting -- imagine if your obit contained the dirty laundry of your family members? Yikes! 1) Eradicate mosquitoes -- mostly agree (but frogs gotta eat too). 2) Bury phone [& power] lines -- oh, hell yeah. 3) Stop speed maniacs -- I'm not a maniac. I wish he won the underground wire battle. Those poles and wires really ruin a perfect sunrise or sunset. Like the house, but didn't most homes like this have very small rooms. I agree with every position Mr. Weeks publically took. I don't know why though, but I have a feeling he wasn't long on a sense of humor. And alas, the mosquito seems to have won. I love the house, by the way. "The objects of the North Shore Improvement Association are to secure cooperation in movements for good roads, protecting the water front, preventing and abating nuisances, securing capable and effective town government, and generally promoting such measures as will tend to protect the territory as a desirable residential region." Sadly, I suspect only the house has been successfully eradicated.